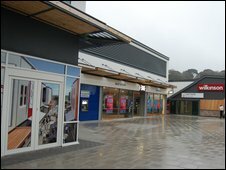 A £75m shopping complex has been officially opened in St Austell as part of a project to unlock the town's business potential. White River Place opened on Thursday with 65% of business space occupied. Five units, including Wilkinson's, which is new to the town, opened, alongside others which had already started trading in the 18-unit complex. 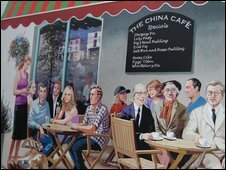 The project was part of a regeneration plan for the town centre which was first unveiled in 2002. White River Developments said 80% of the complex would be filled by Christmas with a mixture of residential apartments, shops, cafes and restaurants. Some shops, including New Look and Peacocks, have relocated from the high street to the new complex. The project was supported by £33m from the Regional Development Agency (RDA). Sandra Rothwell, from RDA, said: "This is about part of a wider package of investments for the long term for St Austell and its wider community." Tim Jones, from Devon and Cornwall Business Council, said: "Many would question whether it's a wise pound spent. "How on earth do you achieve regeneration in an area like St Austell where this scheme has been sitting around for seven or eight years? "There's been empty property around the St Austell area and it's been affected by the downturn. We just need to make sure it works."